Fit Fluential Mom: Raise Your Kids to Be Money Savvy! It's never too early to teach your kids about money. Some parents think children are too young to understand the concept of money but they aren't. They see their parents go to work, go to the grocery store, put gas in their cars and they make the correlation long before you explain it to them that money is what buys you what you need. Now, all parents need to do is show their children how to start learning how to budget their money and use it sensibly at an early age. Parenting magazine suggests using games that involve tasks in your daily routine to show your kids how money works. Some ideas from Parenting magazine (and some added ones of my own) are below! To children, the ATM is like a money tree. You put your card in, enter a number and the money comes pouring out. They don't see that you first have to deposit the money you made while you were at work the past two weeks . So, talk your kids through each visit to the bank and the ATM. First, go inside and deposit the check. Then explain to them that, in the next few days, when you need the money, you will be back to get the money you saved to buy things you need. You explain to them that you worked to make the money, you save it in the bank and, when you need it, you come back for it. Show them the receipt and explain the math, if the child is old enough to understand, so that he/she knows that the money can and will run out if you keep taking it out. Children habitually ask for things when you're out running errands. Whether it's the latest cereal, the latest toy or a candy bar on the way out from the grocery store. Next time they tell you they want a small toy or treat, tell them you'll help them save money for it so they can buy it all on their own. At home, draw a chart with a square for each coin or dollar they need to buy the item. Give your child small tasks to accomplish in order to acquire her money (i.e., take out the trash, walk the dog, clean her room, help wash/put away dishes, etc). Each time she gets a coin/dollar, put a sticker on the chart or color it in. When she has enough to fill the chart and can afford her treat, she can go pick up the item she wanted. Try to make the time it takes to accumulate the money no longer than one to two weeks, just as you would at work for a paycheck. When your child fills up the piggy bank, the natural thing to do is head to the nearest toy store to see what he/she can buy with their loot! Try encouraging saving a portion of it. Allow your child to spend half of the money in the piggy bank on what he/she wants & start a savings account with the rest. It's preferable that you start one with a high yield interest rate so that your child can see the growth faster than in a regular account. CDs and Mutual Fund accounts are great options since this account should only receive money and not have many withdrawls. The goal is for this savings to add up for a long period of time to be a solid lesson in saving money for the long haul. You can show your child the statements each month and how his/her money grows without even putting any money into it! 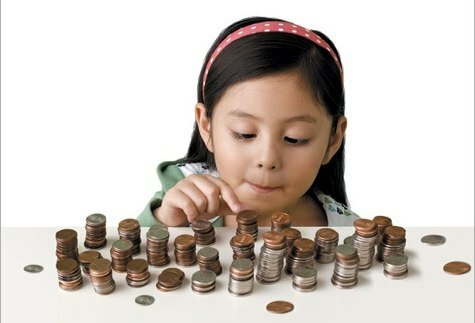 Teaching your kids about money now can help them establish financial security in the future. Many of my adult friends now wish their parents had taught them about saving money early on so they could have applied it as adolescents and into adulthood. Give them the value of money, teach them skills and instill habits that will get them off to a good start early on in life!